Biresin G26 Part B (Hardener) - Industrial Plasters Ltd.
Biresin G26 is a high quality, fast cast, 2 part polyurethane casting resin which is widely used for pattern and model making. It has an easy to use 1:1 mix ratio and has a very low viscosity, so the good followability will pick up the finest of detail from your mould. Although Biresin G26 is pre-filled, so is not normally used with any added filler, it can be filled for some applications. Beige in colour. PLEASE NOTE: You need to order Biresin G26 Part A (Resin) as a separate item. 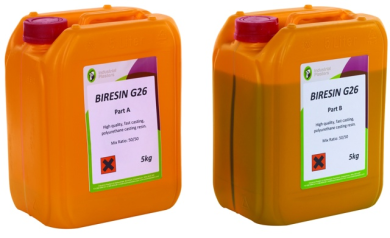 We also stock Biresin G27 which is similar but with a quicker Pot life and Demould time. Both components must be shaken well before use. Please also pay attention to dry conditions and dry mould surfaces while processing.